The groundhog has seen his shadow, Cupid has shot his glut of arrows, now the only thing between you and spring are a few lousy weeks of unfortunate weather. Spring is just around the corner, are you going to be ready to fire up the grill on day one? 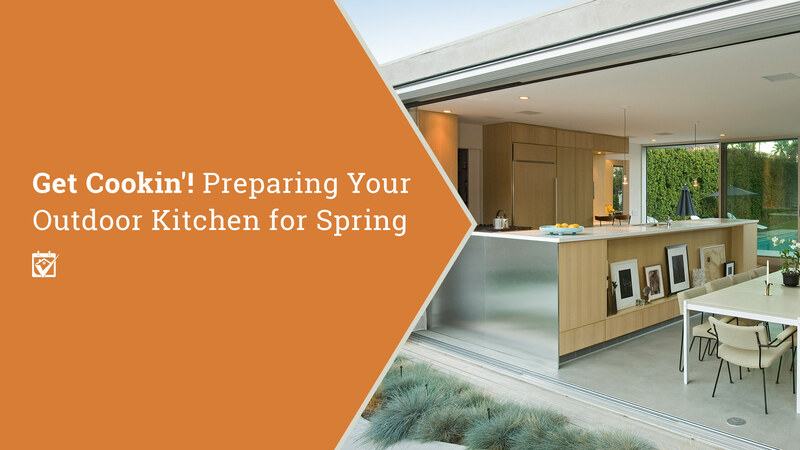 You took the time and effort to carefully put your outdoor kitchen to bed before winter’s cold came, soon it’s going to be time to wake it up again. Now is the best time to check your equipment, restock your supplies, clean your stuff and do any fix-up that might be called for. There’s absolutely nothing more torturous than being able to smell a neighbor’s cookout and not being able to have one of your own. But don’t worry, we’ve got your back. While you’re at it, you may want to look at these other maintenance items that start to pop up as winter’s ice starts to recede. Getting ready for spring can start while winter is still finishing up, provided you have several nice days in a row for surfaces and finishes to dry properly. Even if it does snow again, it’ll just be a matter of rinsing the new layer of dirt away. Once you’re starting to see more than a few days in a row with nighttime weather above freezing, you’re probably good to get started. Presumably, you covered your appliances, so we’re not going to address them just yet. First, we’re going to talk about your deck or patio, as well as any prep surfaces. Just because they were covered in snow doesn’t make them clean. In fact, that probably makes them even dirtier somehow. Start by wiping your counters and other prep surfaces, cleaning out any sinks that might be part of your outdoor kitchen and scrubbing your tables and chairs. Do it in this order so you aren’t having to clean the deck or patio twice. Efficiency! Sprinkle a little water on your clean counters to check the sealant. If those drops are still standing after 10 to 15 minutes, you can skip resealing the counters this year. Depending on your patio or deck’s surface, a simple sweeping with a broom and a hosing down may be all you need to do. Other surfaces might need a power washing and a resealing. You’ll have to judge this based on how the material reacts to your efforts. If water beads on the surface, you’re probably ok to skip the sealant here, too. For decks, make sure you drive any popping nails and replace any that have gone missing. There’s no one definition of an “outdoor kitchen,” so what sort of appliances that this may entail can vary wildly from a charcoal grill with a side table to a high-end gas number, plus a full-size fridge, wine fridge, ice maker, sink with disposal and so on. Whatever appliances you have, you should clean them completely before you turn the kitchen on for the season. It’s always the best time to clean appliances when they’re empty and not in service. Just be careful to dry them completely, inside and out, and cover them up again if they’re going to remain off, in case it does snow again or you get a freak ice storm. When it comes to cleaning your grill, break it down entirely, scrub every bit of it within an inch of its life with soapy water and reseason any cast iron grates as needed. Once you’ve rebuilt the grill, it’s a perfect time to test for hot spots. This Old House recommends covering your grill with slices of white bread and then turning the grill’s heat to high. When the bread’s mostly toasted, kill the heat and flip the bread to learn which areas are cooler and which are hotter. Personally, I prefer to use a handheld infrared thermometer, but to each their own. Calling a professional appliance repairman to do a quick check-up on things like refrigerator compressors and gas lines can also help ensure that your equipment stays in good working order all spring and summer long. You can check gas lines for large leaks with soapy water, but compressors are trickier, so you might as well have the pros look at both while they’re at it. If you happen to get this far a little too soon and have a few more frozen weekends than you planned on, you can always work through our late winter maintenance list to kill some time. That way, when spring actually starts to appear, you’ll have the healthiest house on the block! Seriously, you didn’t think we’d let you go without restocking the larder, did you? Your surfaces are clean, your appliances are ready to go (the pros even said they’re in great working order! ), but what about all that little fiddly stuff you’re always running out of disposables like plates, cups, plastic ware, paper goods? Now’s the time. They never go bad and you can keep them inside if necessary. While you’re out shopping, check out this year’s grilling tools. Your spatula looks like it may have spatula-ed its last burger and that poor pair of tongs was on its last leg last season. Oh, and don’t forget to grab a new meat thermometer because food poisoning is never fun. Last, but far from least, safety gear like fire extinguishers, heat- and cut-proof gloves and something to keep your beard from catching on fire can also prove invaluable. Fire and beards don’t mix. When stocking your outdoor kitchen, keep in mind that animals and bugs live outside. If you’re planning on storing food in the great outdoors, make sure you have a place that’s safe from bugs, animals and mold spores. Better yet, keep food in the inside kitchen in a designated place unless you have an outside refrigerator. There are a lot fewer things competing with you for that last kettle cooked potato chip indoors. Your outdoor kitchen is ready to go, all you need is enough nice weather to invite a few friends over for a big flamin’ cook-up. The waiting can be excruciating, though. While you wait, you can work on other outdoor projects to make your patio or deck space, even more, inviting. The Dunfee Group - powered by eXp Realty- Licensed in the State of Colorado. The real estate listing information and related content displayed on this site is provided exclusively for consumers’ personal, non-commercial use and may not be used for any purpose other than to identify prospective properties consumers may be interested in purchasing. This information and related content is deemed reliable but is not guaranteed accurate by the Pikes Peak REALTOR® Services Corp. Data last updated 2019-04-22T10:40:54.357.